There hasn’t been a dedicated thread for them or much discussion of their offerings aside from a few scattered posts. I think they’re doing a lot of interesting and innovative stuff already, and based on what I know about the mixer module they’ll be announcing soon, I think there will be a lot more interest from the lines community in the days/weeks/months to come. I don’t own it yet, but their Vector Space module and its three CV inputs will definitely be paired with my René’s three CV outputs, and the two will likely become the modulation centerpiece of my rig. Their TMLPGX Low Pass Gate expander for the Turing Machine actually inspired me to think about TM expanders I’d like to design in the future. And I’m sure the LRMSMSLR mid/side encoder/decoder module would appeal to some of you who normally do that work in-the-box. Anyone here have any of their modules and care to share examples of what you’ve done with them? And I’m sure the LRMSMSLR mid/side encoder/decoder module would appeal to some of you who normally do that work in-the-box. I do a lot of LR to mid-side conversion for a wider stereo space without the “unbalanced” or “bouncy” feeling of panning. I like it for Rings polyphony for instance, or when processing one side differently from the other, or layering in a PLL or something. I have to credit DivKid’s video about the LRMSMSLR to really waking me up to the idea… but honestly I haven’t found a compelling reason yet to do the conversion in hardware, instead of using a plugin. If I were running DAWless, sure. Or if I had hardware effects that took stereo inputs? All I’ve got there is Tyme Sefari/SOT, and since its second channel is 100% wet, I prefer running that before mid-side conversion. Oddly enough, I was just running Rings just now through the LRMSMSLR, with the side being processed by the Disting tape delay and then put back into the module. It sounds almost exactly as you would expect. The manual for the module is great, and full of good ideas; worth a read even if you don’t have it. The vector space looks cool, but maybe a bit big for what it does? 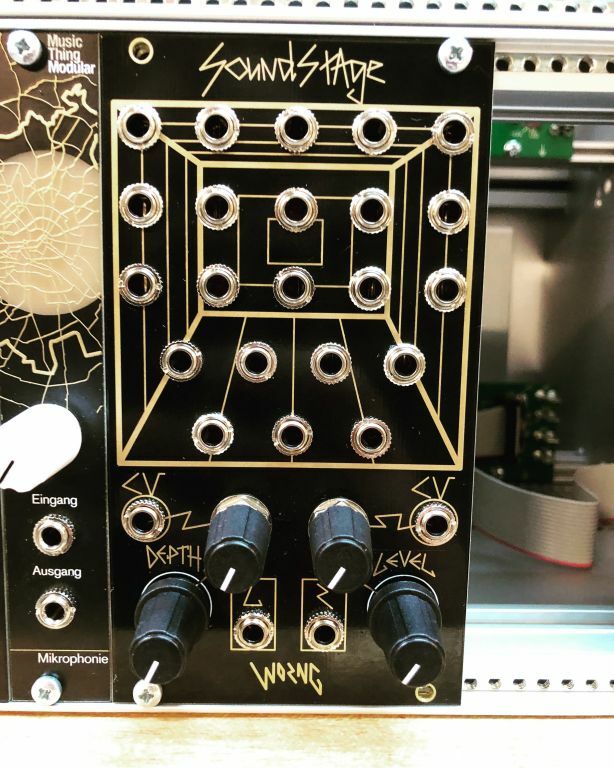 It’s 2hp larger than the Eurorack version of the Wiard Joystick Axis Generator that inspired it. I think it’s perfectly sized for what it does. Anything smaller and it would be incredibly cramped and hard to use, especially the Sphere and Plane outputs in the center of the module. I guess cause it’s all jack sockets, I’m not used to seeing so much space inbetween. If you ran a triple sloths into the vector space would that be, like, 17 sloths!?!? Dont forget about the cool little Bufftest! Buffered mult that acts as a cable tester too. Looks like thats no longer available. I have a LRMSMSLR, which is nice. Im setting up a mixer section in a case today with LRMSMSLR, Nearness, MI Blinds and a Mixup. Nice little distributed ‘non traditional’ mixer section. I sell synthesizers and synthesizer accessories. Wow that looks really unique! Wow that looks very cool. Do you know how many HP? Such a cool concept for a module, love the controls/layout. I bet this plus LRMSMSLR could create some pretty spacious sounds with only a few sound elements. Hope to hear some demos at some point! I love the LRMSMSLR for its concept, to bring a classic audio matrix trick to eurorack. Its something i use on a daily when eqing in my DAW, but never as extreme as in eurock domain. Eg. two slightly different filters flying in and out via lfos and their cancellations. Its really spectacular with overdriven VCA‘s! I tried the SoundStage at Tokyo Festival of Modular on Saturday and talked a bit with Mr Worng, whose name I now realized I forgot to ask (very nice person anyway). He told me he used to do live sound for bands and was used to filtering/EQing instruments in a number of ways and that module kinda comes from that experience, plus the way the SP1200 has specific filters on its outputs (apparently someone wrote a detailed article about that). The goal is to have an easy way to mix a number of sound sources and place them both in the stereo field and make them mix together nicely using filtering. There are about 20 filters in the module and I forgot the exact number but quite a bit of VCAs too. It works well, and the depth control makes it go from unfiltered to filtered, with CV control. There will only be some minor changes before going in production (made by WMD in the US), for example the low-mid section will have one less jack so that there can be one fully centered, and some small adjustments. ed to filtering/EQing instruments in a number of ways and that module kinda comes from that experience, plus the way the SP1200 has specific filters on its outputs (apparently someone wrote a detailed article about that).